The final Regional Championship race is coming up, known either as the Ironman European Championships, IM Germany or IM Frankfurt. It is the last race with “big points” for Kona. Most of the top seeds only need to “validate” their slots after a good Kona result, but a lot of athletes have raced earlier in the season but without the result they were looking for, so most of the field is hoping for a lot of points to be able to qualify for Kona. The Course Rating for IM Germany is 15:28. IM Germany is a P-4000 race. It has a total prize purse of 150.000 US$. German TV will cover the race and will show it on hr3 (available in Germany and adjacent countries). Ironman is going to pick up the pictures and will add their own commentary. The IMLive stream will be available worldwide through Ironman.com. 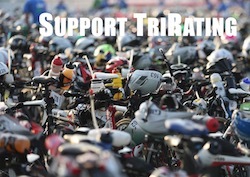 The strength of the field is 31% of a typical Kona field. As IM Germany is a Regional Championship and there are Automatic Qualifier spots for the winners, every participant has a chance to qualify for Kona. Also the P-4000 race has a lot of KPR points so there are a lot of athletes that should be able to qualify even without winning the race. Here are the minimum finishes to get close to the cutoffs for most of the participants. The male cutoff for July is projected to be around 3.500 points. With 3.780 Thiago Vinhal is already in a good position to qualify, I’d be surprised to see him racing. A podium finish (3rd place is 2.890 points) should be enough for Esben Hovgaard, Ivan Risti, Michael Ruenz, Trevor Delsaut, Bas Diederen, Phillip Koutny, and Peru Alfaro – the list gets almost too long to mention! The female cutoff is likely to be around 4.300 points. Sarah Crowley (winner of IM Cairns) is already safe for Kona, but she indicated that she wants to try the “double” and see how she handles racing two Ironman so close together.